By LUDWIG VON KOOPA - If this is true, then this is extremely pleasing! "The first-of-its-kind survey explored the political attitudes of video game players, providing a snapshot of their political leanings and positions on key issues." Yo, what? 48% conservative? I thought we were in the MINORITY. 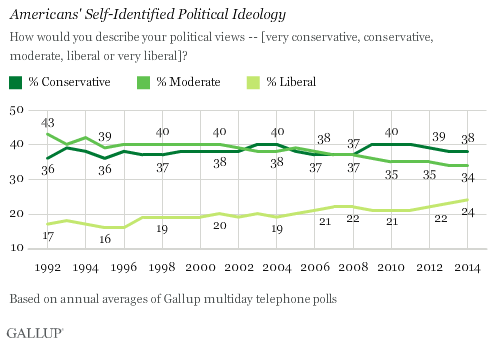 Conservative beats Moderate who beats Liberal. So what does this mean? Let's look at how the ESA defines a "gamer". They are an American adult that plays games at least 3-4 hours a week. (I'm not gonna talk about how many hours a week I play games. But I at least am documented to meet that at least every three weeks during a Splatfest.) Of course, this could pretty much be anyone, even the guy who just plays on his smartphone during the train ride. But let's look at this closely. Videogame players are apparently 10% more conservative on average, 20% less moderate (assuming that's "other"), and 14% more liberal. Basically, it looks like gamers are more polarised than the public, or perhaps the way the study commissioned by the ESA was flawed. That 14% "other" is really suspicious, and the fact it's worded that way probably means the ESA is counting would-be moderate people as either conservative or liberal. Keep in mind that KoopaTV has internally held this GameFAQs poll on gamers' political views as gospel. 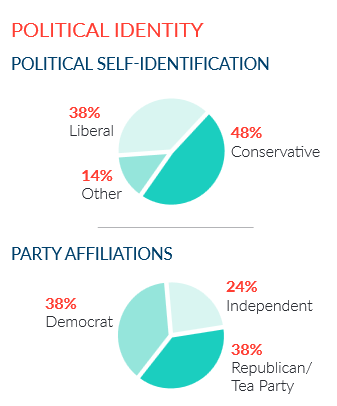 As for party affiliation (and it's important to note that political values and party affiliation are different), gamers are apparently 15% more likely to be Republicans, 15% less likely to be Independents, and 6% more likely to be Democrats. Okay, how does that make sense? That doesn't pass the common-sense test. Let's look at specific interesting issues, assuming that this study is credible, which I don't think it is. 41% of gamers apparently report being "better off" financially than they were when Obama took office. While this figure seems dismal, it's actually much better than the average American according to a Washington Post-ABC late 2014 poll. This makes sense if you consider that gamers are likely to be more affluent than the average person, especially considering how expensive gaming as a hobby is. That 41% is much higher than the 22% the average American feels! Gamers, for whatever reason, are also way more likely than the average American adult to think humans cause global warming. (Well, I guess that makes sense.) As for the vouchers/school choice questions, it's hard to find an unbiased poll on that. The request to reduce federal spending is pretty in-line with the average American. And the International Affairs question is also... hard to gauge, especially what that even means. Hopefully all of these gaming, engaged voters watch Republican Debate Night 4 on November 10 on Fox Business! There will also be the official Democrat Debate Night 2 on November 14 (a... Saturday?) on CBS. Stay tuned for those. Keep your favourite website (or some sub-favourite but still positive status) as KoopaTV, because KoopaTV wants those 48% of conservative gamers reading these pages. KoopaTV also wants the other 52% as well, because KoopaTV is Fair & Balanced! It looks like gamers are diverse, but what about developers? Curious that a higher percentage of gamers say they vote, too. I wonder if any of this is connected to age. Well, it should be the opposite. The median gamer is 35, according to the ESA. The median voter is 45. What is more likely is that, according to sociology, people are more likely to vote if they're educated and wealthy. Gamers are certainly more likely to be wealthy.